Are there any original ideas or are all ideas sparked by something that already exists, somewhere? Austin Kleon suggests that when we honor those who have created before us by studying their work in depth rather that dipping into their work for a minute, when we give credit to all those who have inspired us, when we draw inspiration for who we are and who we want to be from a wide pool of talent, when we transform ideas into something truly our own, and when we create what can genuinely be called a remix (as opposed to a rip off) we have done ourselves proud. The ‘takeaways’ from these notes that should be shared with students? There is a ‘hierarchy’ of creativity: It is ok to start with copying as inspiration but don’t stop there and call it what it is – not your own. Ask yourself: Would you be ok with meeting the original creator of the work you are claiming as your own? 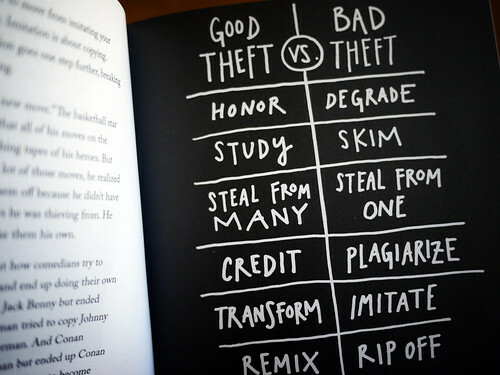 Here’s an example of what I consider “Good Theft” (and I may be biased because I am the artist in question!). I am a big fan of Seth Godin. Love him. When he wrote his manifesto on education, I devoured it. In it, he challenges people to do something with his ideas, so in the spirt of Dr. Seuss and mirroring the monochromatic, square book that I associate with Austin Kleon, I penned my own version of Stop Stealing Dreams and called it Imagine A School. My list of creators that inspired this book is long, I wanted to be unique AND part of something, and while I haven’t stood in an elevator with Seth Godin, I have stood in an auditorium with him and he didn’t punch me in the face but rather gave me a standing ovation on behalf of all teachers who are trying to make a difference. We have to teach responsible use but at the same time we have to teach awesome curation skills, expose our students to quality ideas that inspire, connect them with people who are making a noise. The more they are exposed to how to do it right and more importantly WHY they need to care about doing it right, I believe the richer we all will be. And it can start young. My second graders are able to find images via Google search that are licensed for non-commercial reuse with modification. My fourth graders are adding links to Keynotes to reference their images. There are tools that are making it even easier for people to make the right choices – because they are being made for them. Apps like Haiku Deck and Adobe Voice use Creative Commons licensed images when you search for a photo within their app or icons from The Noun Project which are licensed for reuse. All images are then cited in the credits of the presentation and options are given for you to add your own credits if you source images from elsewhere. Why? Why go to all this bother of citing, referencing and giving credit? Because otherwise we are devaluing ourselves and the original creators of the work and drawing everyone into a less civilised society. And we are all better than that, right? 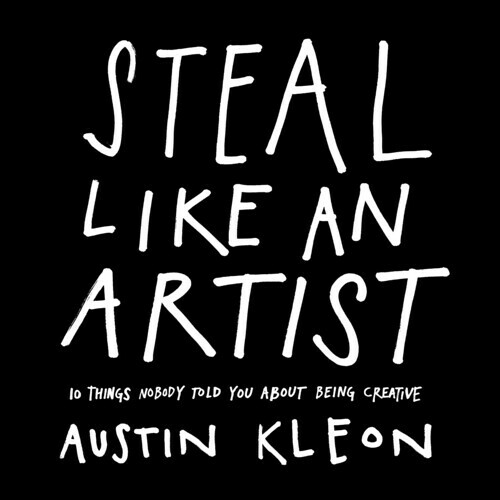 I posted about Austin Kleon. I posted about Kirby Fergusson. I posted about Visual Representation of Verbal. Now look at what I found…..TA DA! Did you know that the most creative companies have centralized bathrooms? This is the line that totally grabbed my attention when I first read it. Can you imagine? Makes me think of Ally McBeal, actually! The video below is a 90 second preview of Jonah Lehrer’s book, Imagine. He describes creativity as “our natural state”. Love it. The video itself is worth watching for the sheer brillance in the use of graphics at speed to convey a message. So good! This book is on my wish list and ever-growing pile of ‘books I need to read’. A quick peruse of his website and he is quickly climbing to the top of my Fabulous People Club list too! I then went on to type a list of what everyone else had to say and turned that into this. What words would you add? One of the workshops I went to at the NAIS Conference was on The Taxonomy of Creative Design by Peter Nilsson. The workshop was very thorough, with underlying the message (bear in mind you are getting a major summary here – please visit his website for a more full understanding of the work he has been doing) was that in a way similar to Blooms Taxonomy, we can actually have a Taxonomy of Creative Design. This was interesting if a bit analytical and ‘boxy’ for my liking. What I did like about it was that it gives a framework to teachers who are now asking “Well, how can I be more creative, add assignments of a more creative nature and extend creative thought in my classroom?”. Peter shared some examples of work that would fall in each category and this is an area I want to pursue further. His taxonomy looks like this with ‘curation’ at the point where novelty in form and novelty in content meet. 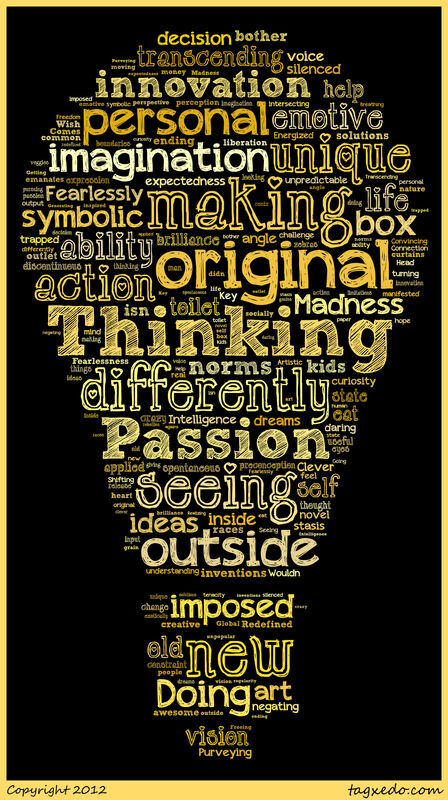 That leaves me with three last ‘gems’ on the topic of creativity. If you have seen them before, you know where they are when you are ready to look at them again! If they are all new to you, then you are in for a treat! 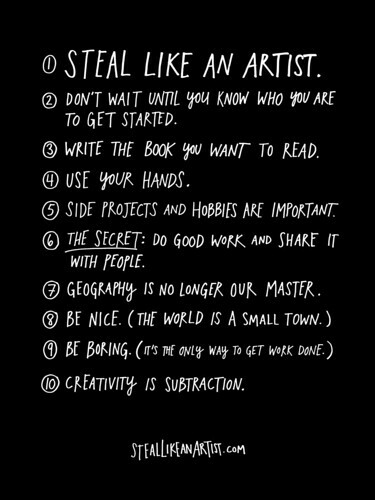 I’m not picking on you, Austin, just sharing some Seth Godin love! The book is beautiful but more importantly, it is so cool in the way it talks about how everything really does come from something else. One of my favorite parts is when he talks about creating your own genealogy of creativity – your creative family tree. Immediately, the crafter/art teacher/elementary school teacher came together in me: Start by taking all the people, things, passions you love and arrange them all at the top of a page. Now make another copy and lay them on top – you might even want to have a pile of three or four of each (you will see why in a minute!). So, have you got it – Steve Jobs, Picasso, Running Shoes, iPad, Art Supplies, Kandinsky, Jamie Oliver, Ansel Adams. These are my ‘grandparents’. Now, move ’em around. Mix ’em up. What would Steve Jobs, Jamie Oliver and Kandinsky make together? What about Kandinsky and Ansel Adams? Running Shoes and an iPad? Bring your passions together in weird and unusual ways and see what you end up with! Copy, transform and combine. It’s who we are, it’s how we live, and of course, it’s how we create. Our new ideas evolve from the old ones. ~ Kirby Fergusson. FYI, His new work, which has just been funded by Kickstarter donations, is called “This Is Not A Conspiracy Theory” which is designed to give perspective as to ‘where we are now’ with the first episode due out before the US Election. This is a totally FREE project that Kirby has opened up to be remixed as people see fit. Kickstarter is a great way in and of itself to ‘fund and follow’ creativity, describing itself as “the world’s largest funding platform for creative projects”. This is a treasure trove of good stuff waiting to be discovered! Finally, these videos blow my mind every time I watch them. Pure creative genius. Enjoy!